It is a real shame we didn’t publish last week, as it was blatantly obvious to us the FTSE was an accident waiting to happen. The only surprise was that the FTSE got as far as it did, and 7350, or R3 to us, played a pivotal role last week. The intraday high on Tuesday was 7350.10, on Wednesday it got up to 7341.57 for its second attempt, and then on Thursday, strike 3, it peaked at 7370.61. However, the most telling aspect was the close on Thursday at 7355.31, and the fact that R3 wasn’t retreating, so the bulls were certainly keen, but, as we say, it was an accident waiting to happen. 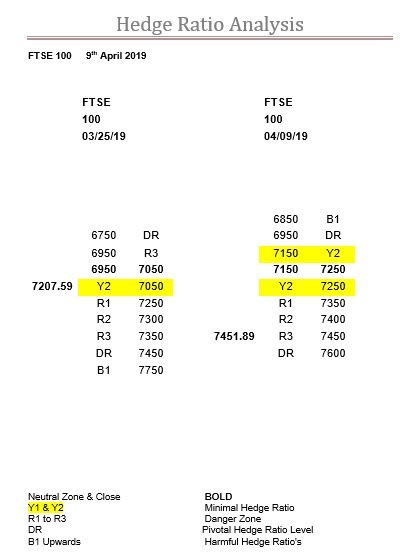 Of course, had the other markets not been in similar circumstances, then the FTSE may well have gone on to test DR, but then it’s all about risk and reward. Which to us, with a 200-point Y ratio bandwidth above a zone that is way down there at 6950-7050, the risks were certainly at the top end of the scale. 7250 is now the new critical level.